"Camp Victory, Afghanistan" is a verité documentary that tells the story of several U.S. National Guardsmen stationed in Herat, Afghanistan and the Afghan officers assigned as their mentees. These Americans along with a band of Afghans have been given the enormous task of building the 207th Corps of the nascent Afghan National Army into an institution capable of providing security, stability, peace and justice to a tattered, volatile nation. Although the United States has poured military aid into Afghanistan, money alone does not produce an army; people do. And these Afghans and Americans have more in common than anyone would expect. With lives on the line and the military budget ballooning, can a modern Afghan army be created when 80% of the enlistees are illiterate; all are impoverished; the weaponry is second rate; and the enemy is elusive, dangerous, and lawless? 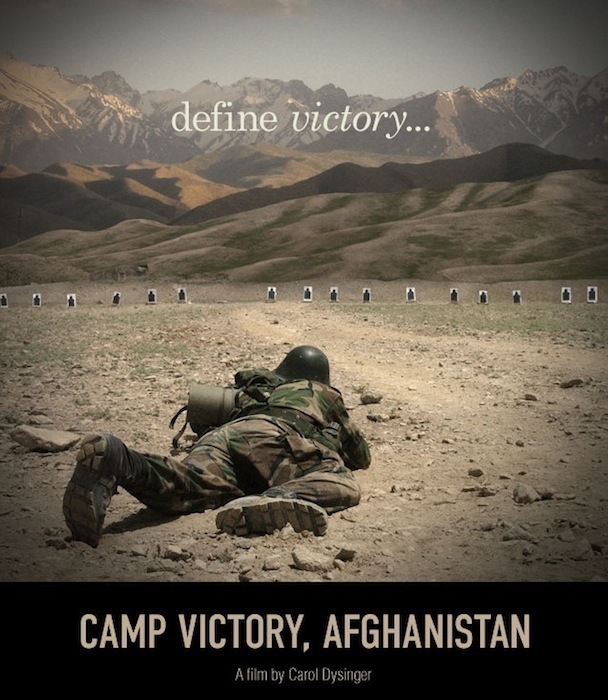 Using nearly 300 hours of verité footage shot between 2005 and 2008, "Camp Victory, Afghanistan," directed by Carol Dysinger, is the first film to examine the reality of building a functioning Afghan military—the initial critical step toward bringing stability and peace to Afghanistan. Summer 2010 – Following the film's highly successful festival run, Kristin joined the team as the film's advocate and broadcast strategist, with the goal of securing as many PBS station air dates as possible for "Camp Victory, Afghanistan." Over a four month period, Kristin's efforts secured nearly one thousand broadcasts covering 81% of the US, making "Camp Victory, Afghanistan" available to well over ninety million homes across America. "I am so confident that you saw the movie I made and I am unbearably grateful that you are on this." "You did a great job for my film. I am happy to pass along the news to film makers who look at me and say NETA? I just say "The answer is Kristin...""
"We deeply appreciate your enthusiasm, professionalism, and diligence and the phenomenal results you achieved. Thank you for everything!" "Thank you SOOOO much for the INCREDIBLE work you did, and continue to do. You're just the best!" Carol Dysinger has been a feature film and documentary editor for the past 25 years. Her editing credits include: the Emmy-nominated documentary film, Deadline (Sundance Film Festival; NBC 2004); Rain (Sundance Film Festival; Venice Film Festival); the Emmy-nominated documentary film, Punk; and Santitos (Sundance Film Festival). Carol has served as a consultant for a variety of documentary films, feature films, and music videos. She also had a career as a screenwriter with scripts produced for 20th Century Fox, Disney, and HBO. Carol is a tenured Professor of Graduate Film and New Media at NYU Film School in the Tisch School of the Arts.